I've not been near a Note7 when it explodes, but having watched videos and seen pictures of said event, I'm assured fire, heat, and general explosiveness are involved. Probably best, then, not to use it with Samsung's Gear VR headset. 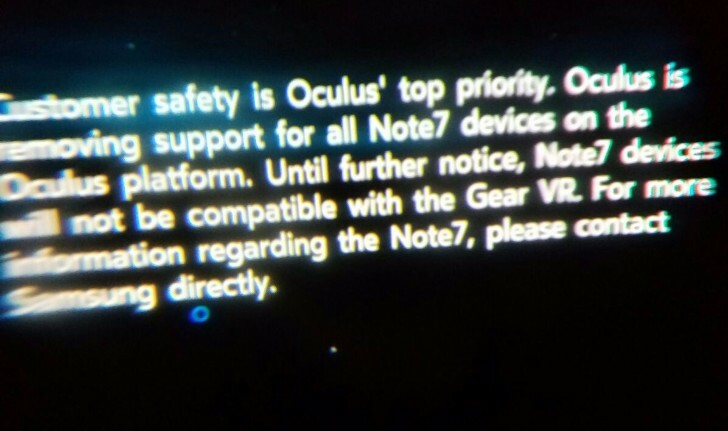 With that said, Oculus has duly disabled the Gear VR app on the Note7, in the interests of safety. Customer safety is Oculus' top priority. Oculus is removing support for all Note 7 devices on the Oculus platform. Until further notice, Note7 devices will not be compatible with the Gear VR. For more information regarding the Note7, please contact Samsung directly. This is a timely move, seeing as Samsung has halted production and told customers to return the phone, plus all four major carriers in the US declining to sell the device. The fallout from a Gear VR catching fire or exploding while strapped to someone's face in the Gear VR headset is unimaginable. Other Samsung phones, including the S7 and S7 Edge, S6 and S6 Edge, and the non-explodey Note 5 still work with Gear VR. If you still have a Note7 in your possession, power it down and return it as soon as possible.